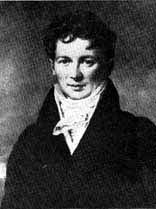 François Magendie (October 6, 1783 - October 7, 1855) was a French physiologist, considered a pioneer in experimental physiology. Born in France, Magendie researched the different motor functions of the body in relation to the spine, as well as nerves within it. In addition, he researched the effects of morphine, quinine, strychnine, and a multitude of alkaloids. Noted as the father of experimental pharmacology. His most important contribution to science was also his most disputed. Contemporaneous to Sir Charles Bell, Magendie conducted a number of experiments on the nervous system, in particular verifying the differentiation between sensory and motor nerves in the spinal cord, the so-called Bell-Magendie law. This led to an intense cross-Channel rivalry, with the British camp claiming that Bell published his discoveries first and that Magendie stole his experiments. The bitterness of this scientific rivalry perhaps can only be compared to that between Isaac Newton and Robert Hooke. Magendie was also a notorious vivisector, shocking even many of his contemporaries with the live dissections that he performed at public lectures in physiology. Richard Martin, an Irish MP, in introducing his landmark bill banning animal cruelty in the United Kingdom, described Magendie's public dissection of a greyhound, in which the beast was nailed down ear and paw, half the nerves of its face dissected, and left overnight for further dissection, and called Magendie a "disgrace to Society." A quaker once visited him, questioning him about vivisection; according to Anne Fagot-Largeau's inaugural lesson at the College of France, he responded with much patience, arguing the reasons of animal experimentation1. Besides drawing sharp criticism from contemporaries in both Britain and France, later scientists critical of Magendie's methods included Charles Darwin and Thomas Henry Huxley. He was also a major impetus of the antivivisection and vivisection reform movements, with Albert Leffingwell dedicating a chapter of his book An Ethical Problem to the man.